﻿Why is SPF Energy Efficient? Polyurethane foams have one of the highest insulating R-values per inch of all the available products on the market today. With typical values ranging from 3.5 to 6.0 per inch, it is possible to maximize efficiency, increase space utilization and reduce operating costs, while having thinner walls and a lower profile roofs. Studies show that increasing the thickness of your roof insulation by 1” or more above the ASHRAE required thickness significantly reduces your energy costs. SPF sealants that are applied to cracks around window frames expand to fill energy-wasting (escaping) gaps around the window, which increases your buildings energy efficiency. Energy studies performed by Texas A & M on their own roofs show the energy cost reductions obtained by applying SPF to more than 8 million square feet of roofing paid for the cost of the retrofit in a little over three years. Cool roofs (using reflective plastic coverings over SPF insulated roofs) bounce sunlight and radiant heat away from a building, helping the structure stay cool and reducing energy use for cooling. ﻿What are the benefits of SPF? SPF is environmentally friendly, contains no formaldehyde or ozone depleting chemicals, saves energy* and reduces the use of fossil fuels, thereby reducing global warming gases. It also assists in providing good indoor air quality, requires less energy to produce than the leading insulation, and reduces the amount of energy required to transport and install it. SPF is durable, maintains physical properties over time, contributes little to the waste stream, and in a single product (depending on the formula and project) can take the place of three-four other products, including insulation, air barriers, sealants, vapor retarders, and weather barriers. Spray Polyurethane Foam's monolithic nature provides superior waterproofing when compared to conventional BUR or single ply systems. This is because those sytems are layered and/or contain seams and when compromised will allow water to travel extensively throughout the system. 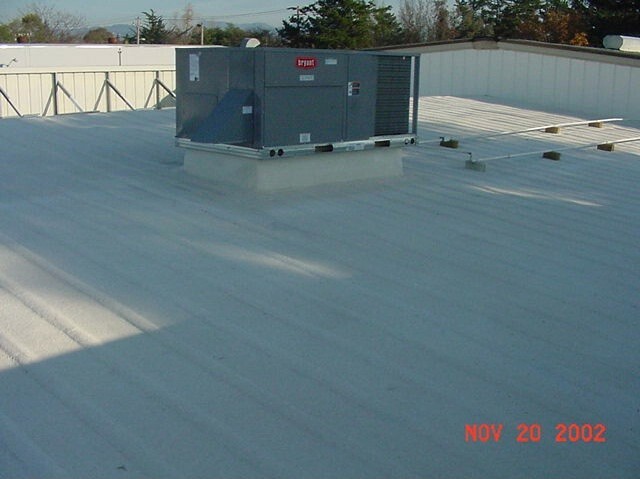 The foam roofing system is spray applied to all penetrations, curbs, roof-mounted HVAC units and parapets in a seamless application which eliminates a common source of leaks. A leak in the membrane of a single-ply or BUR roof allows the spreading of water which can allow multiple leaks into your building. The SPF system has no seams, cracks or fasteners through which water can penetrate through. In the event a hole is punched through the SPF system, the water movement is restricted to that hole. SPF cool roofing Systems are simple to maintain. Minor damage is readily identifiable and easily repaired. SPF Cool Roofing Systems can be installed directly over most existing roof surfaces elliminating the need for costly and disruptive tear-off procedures. No heavy tar fumes. 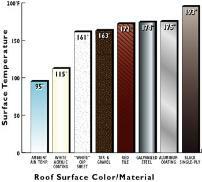 SPF Cool Roofing Systems are versatile. 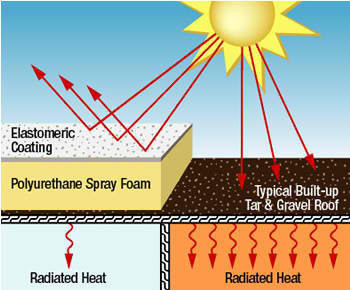 The SPF system has the ability to correct depressions and poor drainage by building up the foam in the ponds on the roof and creating drainage the ability to correct depressions and poor drainage by buildng up the foam in the ponds on the roof and creating drainage crickets that facilitate positive drainage. The weight load is very low compared with conventional BUR sysytems while still providing outstanding strength to the roof. A major cause of heat gain in the conductive heat gain through your roof system. The drawing above illustrates the advantages of SPF roofing system in reducing heat gain. In comparison to conventional roofing, the SPF Cool roofing System is the most energy efficient system available. You can typically expect to recover he entire cost of your new foam roof over a short period of time. Spray polyurethane foam is the best insulating material available today. Its closed cell nature results in the highest R-value per inch of any insulation material. The white reflective top coat also makes it the coolest under the direct sunlight (see table below). Copyright 2013 DJM Coating Services, Inc.. All rights reserved.